He got the girl; got a baby; got a place to live. Johnny Depp is growing up and he likes that just fine. He’s a little embarrassed by the self-parodic weirdness of it all—welcome to the wonderful world of Johnny Depp and his amazing self-inflicted knife wounds?—but his bashfulness is becoming: He could be a teenager showing off his record collection. We are sitting in the open-air restaurant of a hotel just off the Champs Elysees in Paris, the city that Depp has called home for more than a year. He strolled in wearing shades, hiking boots, a rather prickly-looking goatee, no watch—and carrying no wallet, pulling bank notes from his pocket as if someone else had put them there. Only the fact that they are 500-franc notes dispels the illusion that he's just another American student in Paris rather than a movie star with a raft of films coming out. It's a good question. (If only you'd asked it a little earlier, Roman.) Depp is actually 36, a fact that seems a little startling given how well he’s played the role of Hollywood’s worrisome delinquent son: tabloid target, barfly, scourge of hoteliers, grunge anti-icon. He has resisted heartthrob status the way a cat resists a bath, instead choosing an array of roles a step back from the limelight, in the coolness of shadows—misfit goths (Edward Scissorhands), tortured teens (Gilbert Grape), cross-dressing movie directors (Ed Wood). And every now and again, just when his taste for the offbeat has threatened to get the better of him, he has remembered the virtues of keeping to the beat. For what could be more boring—or less odd, for that matter—than a stream of uninterrupted oddity? 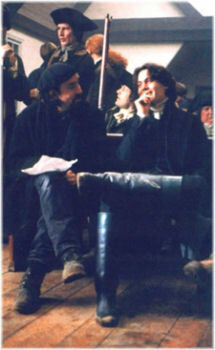 This year sees the release of no fewer than three new Depp movies: Tim Burton’s Sleepy Hollow, The Astronaut’s Wife, directed by Rand Ravich, and The Ninth Gate, “the most mature role in his career,” says Polanski—all arriving amid vaguely libelous reports that Depp has settled down and become a father. “I came over her to make a movie, met a girl, got a place, had a baby,” he confirms, with the trippy look-how-life-happens-to-me cool of his literary hero, Jack Kerouac. The place is an apartment in Montmartre; the girl is Vanessa Paradis, singer, actress, and onetime face of Chanel; the baby is a daughter, Lily-Rose Melody Depp, who arrived in May. 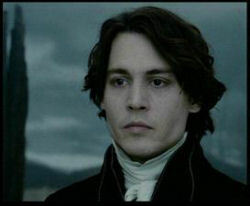 Quite a rush of responsibilities, and the way Depp tells it, it is a rush, in every sense. “When Lily-Rose arrived, you know, it was sorta like . . . boom! It was just sort of . . .”—he makes takeoff motions with his hand—“bang. You hit the pavement and it's strong beneath you and suddenly you realize, ‘Ah, that's what it's for. That’s why you care about integrity or doing things without compromise. It’s for that. It’s for her.’” It’s a wonderfully typical Depp response: a sweet stumble of inarticulacy that somehow straightens itself out, after a few false starts and dead ends, to a rousingly gallant finale. A good working model for his life, perhaps. Depp’s relationship with the tabloids has something of the quality of a bad marriage—of a couple unable to get on, equally unable to separate, their crabbiness still lit up with the odd thrill. Witness the recent incident during the shooting of Sleepy Hollow in London, when Depp took off after a gaggle of paparazzi with a plank of wood. “I was having dinner with friends when these photographers turned up. I said to them, ‘Please, I don't want to be what you want me to be tonight. I don't want to be Johnny Depp.’ But they wouldn't stop, so I just grabbed this one guy who had his hands kind of reaching in the door, and then I grabbed a piece of wood and smacked him in the hand and I said, ‘I want you to take the picture. Take the picture.’” Depp is fired up—eyes ablaze. “It's a moment in my life that I will love until my last breath, because what I saw in their eyes was pure, unadulterated fear. They didn't take the picture. It proves something, something sad, but—violence, most of the time, is the only thing that works. And for the moment I loved it, just watching all this stuff go down. Even the cops arriving. A beautiful kind of moment, you know.” And in that dippy epiphany you have Johnny Depp: a guy who can't even get arrested without it becoming some glorious disembodied trip. “I just can't believe the English tabloids didn't use the headline ED WOOD,” laughs Tim Burton, referring to the last movie he and Depp made together. Sleepy Hollow is their third collaboration: an adaptation of Washington Irving's classic tale about Ichabod Crane and the headless horseman. “I liked the opposition between a character with no head and a character who lives entirely in his head,” says Burton, although he could equally be talking about himself, or Depp for that matter. You wonder how on earth these two chronic dreamers have survived in the movie business, until you remember that, for the duration of three movies at least, they’ve had each other. Reports from the set of Sleepy Hollow suggest that Burton’s dark visual wit has been working at fulltilt—his designs have all their usual wild, tumorous proliferation. “I respond more to the visual,” says Burton. “I'm not the most verbal, so it’s nice with someone like Johnny, who understands with only a few words—there’s that connective tissue.” It’s a fair warning to talk show hosts to steer clear of the pair of them (“I went on The Arsenio Hall Show with Johnny once . . .” remembers Burton. “Ten minutes of silence.”) but also a subtle reminder of the fact that their best work together approaches the rarefied plane of silent cinema. Sleepy Hollow is all flickering Cabinet of Dr. Caligari grimaces, while the character of Edward Scissorhands—with his blade-sprouting fists and petrified shuffle—was like some cross between Buster Keaton and a pair of garden shears. Edward Scissorhands was their first film together and remains their best: a perfect little fable of an orphaned mutant adrift in toytown suburbia. The contrast was essential, for Depp is at his best when he has a straight man to loop-the-loop around—Marlon Brando’s baffled shrink in Don Juan DeMarco, Dianne Wiest’s Avon Lady in Scissorhands. Kooks, more than anybody, need contrast, or the result is a sort of weirdness white-out: They fail to show. 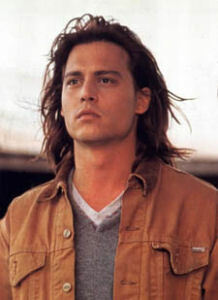 Benny and Joon attempted to pair Depp up with an oddball soul mate and ended up with a banana-mash of cuteness, and he was simply lost amid the cult clutter of Emir Kusturica’s Arizona Dream and Jim Jarmusch’s Dead Man. Depp’s taste for obscure art house follies like these is one of the more sweetly exasperating things about him. (I particularly like the sound of Divine Rapture, a movie he once made in Ireland with Brando, which didn't even get finished.) “Commercial success scares me a lot more than commercial failure,” he says, cleaving to the old battle lines between realizing just how safe that sounds. A film that doesn't dare succeed can never be said to have truly failed either: It has put itself beyond all criticism. Indie filmmakers like to see themselves as the fully certified mavericks in the pack, pushing the envelope, living close to the edge, out on a limb—or wherever it is that fully certified mavericks like to hang out—but in truth it's a pretty risk-free environment. Doing the opposite of what Hollywood would do does not ensure that what you have produced is art. It simply means that what you have produced is three hours long and has Iggy Pop in it. Depp, though, seems free of the arrogance you usually find at the outlaw-chic fringes of indie cinema: The guy doesn’t have an arrogant bone in his body. But he is self-protecting. You catch it both in his performances and when you meet him: an impenetrable, distracted manner erected to protect the sweet and soulful person within. Dreamers, after all, can't be touched. Kookiness is a great cloak. In a sense, all of Depp’s career has been pointing here: a flat in Montmartre, a country with a more laissez-faire attitude toward temper tantrums, friends who compare him to 19th-century Symbolist poets. His career has always had a European slant to it. Now that he’s actually in Europe, though, doesn’t it rather defeat the point of the man? His love of France feels sincere, if a little secondhand (its art, its history, its literature: the usual). You hope that he can burrow past his reverence for the place, find something to scratch his sense of irony—a macramé owl or two—and keep his powers of observation on the hop. A Johnny Depp who feels perfectly at home is no good to anyone.